That is a generic Arab/Muslim accusation. Whoever opposes you is working for the Jooooz: Hamas, Hisbollah, Fatah, Muslim Brotherhood ect. pp. ... The Elders of Zion control their every move. Are these radical islamists who celebrate "death to America and the Jews day" on Tuesdays, Wednesdays and Thursdays, or moderate islamists who only celebrate it on Mondays? So I am not hearing much about Oman? Are they staying out of the fight? A big boom. Supply depot? Is it me? Or does it feel like the Saudis and Iranians are heading towards war? They have been at war by proxy since 1975 or so. Not strictly armor-related but I'll relate a couple of interesting stories from Yemen nonetheless. I was talking to a couple of Bahraini F-16 drivers last week and they had just come back from flying in Yemen. One of them said during his first sortie there, he as flying as the 4-ship flight lead but since it was his first combat sortie, he was a flying a two-seat F-16D with another pilot in the back who already had several sorties there under his belt. He said when he got to the target area he was pissed to discover a whole bunch of clouds obscuring the target area when the weather officer had promised it was going to be cloudless and clear. So he mentioned to the other pilot on the interphone, "What the hell is wrong with our weather guy? He said he was going to be clear but I can't see the damned target through all these clouds!" To which the backseat pilot said, "Those aren't clouds. That's AAA [anti-aircraft artillery]." "Oh..."
The other guy said he got diverted to a CAS sortie to hit a rebel tank on the top of a mountain. He said when they got there, on top of a really steep, tall mountain, there was a Houthi tank. He couldn't figure out how they got it up there. He said his was told afterwards that the rebels bury their tanks almost completely in dirt to hide them and also spray them down with water after they fire in an attempt to obscure the IR signature. The important thing to remember is that most of the combat capability is not from the houthis but the Yemeni military loyal to Ali Abdullah Salleh. The guy Barak threw under the bus. Video of Houthi rebels destroying a Saudi AMX-30 using a ATGM (4:50). Of course, after the hit they congratulate themselves by their typical cursing of Israel and the USA. Stationary tanks as COPs. Cant think of a better target for ATGMs in that terrain. It looks as if the UAE have deployed their G6 artillery, as can be seen in the video along with Leclercs. And yes, they do appear to be using a 40km plus system in the direct fire role. Yemen's president is reported to have returned to the southern city of Aden after six months in exile. Officials at the city's airport said a plane carrying Abdrabbuh Mansour Hadi had landed on Tuesday. A government source told the Reuters news agency Mr Hadi would spend the festival of Eid al-Adha in Aden before flying to New York to address the UN. In July, pro-government militiamen and soldiers loyal to Mr Hadi drove the Houthis out of Aden with the help of coalition ground forces. However, residents have complained that Aden has descended into chaos and lawlessness, with jihadist militants affiliated to al-Qaeda and Islamic State seen on the city's streets, and that the local authorities have been slow to restore services. Last week, Prime Minister Khaled Bahah returned to Aden with seven ministers to take up residence, and acknowledged the government faced major challenges. The UN says almost 4,900 people, including more than 2,100 civilians, have been killed in fighting on the ground and air strikes since 26 March. Earlier on Tuesday, witnesses and medics said at least 20 people were killed when coalition warplanes bombed two buildings in the capital Sanaa, which the rebels seized a year ago. The identity of the casualties was not clear. One security source saying they were mostly Houthis, but the rebel-controlled Saba news agency said they were civilians. The Saudi defence ministry meanwhile said two soldiers had been reported missing after getting lost inside Yemeni territory. Evidence suggested they were being detained by rebel forces, it added. The acknowledgement comes days after a man who identified himself as a captured Saudi soldier appeared on a pro-Houthi television channel and said he was being held with several comrades, the AFP news agency reported. Since regaining control of Aden, forces loyal to President Hadi and coalition troops have advanced northwards towards Sanaa. However, their offensive is reported to have stalled in Marib province, east of the capital, in recent days. 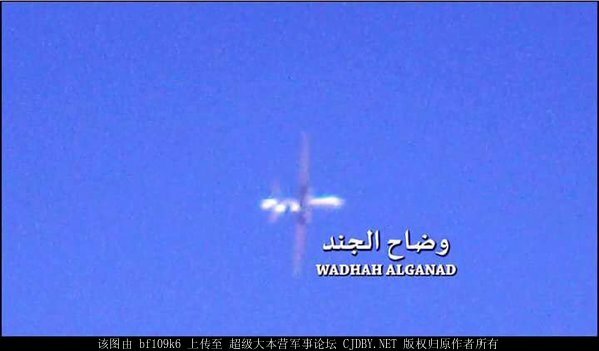 Chengdu "Pterodactyl I" UCAV flying over Sana'a. Both Saudis and UAE use it but I would put my money on Saudis flying it. Edited by Yalmuk, 30 October 2015 - 1331 PM.